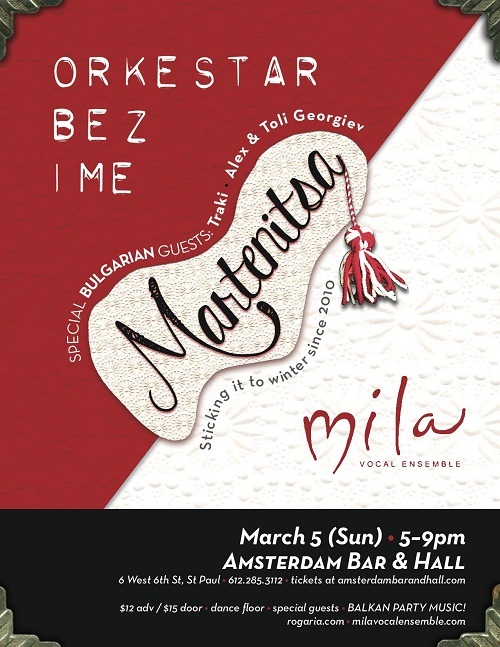 Twin Cities, MN—Orkestar Bez Ime (OBI) and Mila Vocal Ensemble proudly present Martenitsa, an annual Balkan celebration of spring—now at the Amsterdam Bar & Hall in St. Paul. What started as a small underground gathering of Balkan music-obsessed fans and the local Bulgarian community has grown into a massive Balkan dance party featuring music from Bulgaria, Macedonia, and surrounding areas. This year, they bring back a special group of Bulgarian guests to the party: the Twin Cities-based folk ensemble Traki, upholds the traditional Bulgarian folk idiom while also adapting to the ever-evolving Bulgarian folk music scene. The group is a longtime collaborator with both OBI and Mila, and, in fact, helped initiate one of the first official Twin Cities Martenitsa celebrations a decade ago. With this amount of musical fireworks, audience members can count on a festive and memorable Martenitsa to light up the Amsterdam! OBI and Mila’s musical celebration of the coming of spring—traditionally referred to as the ancient Bulgarian holiday of Baba Marta (baba meaning “grandma,” and Marta a derivative of the word for “March”)—is highly anticipated every year, not only for the music and camaraderie, but also for the symbolic parallel many Minnesotans feel during a long winter: Traditional folklore depicts Baba Marta as a temperamental old woman whose moods are as changeable as March weather. On March 1st, it is customary to exchange and wear Martenitsi—tokens of good health, luck and vitality. Wearing the red and white yarns of the Martenitsa symbolizes the hope that Baba Marta will smile and grant us an early spring. As we Minnesotans know, the end of winter can never come soon enough.